We dream about them. We ogle them. We remember our first one. They are our cars. They take us on adventures, joy rides and to the market. Even though we often complain that we live in our cars - we still give them names, we still like the smell of a new interior and we all know what our ideal ride is. The relationship we have with the automobile is truly a love affair. This painting is done in both watercolor and acrylic on Arches 140 Lb. cold press paper. 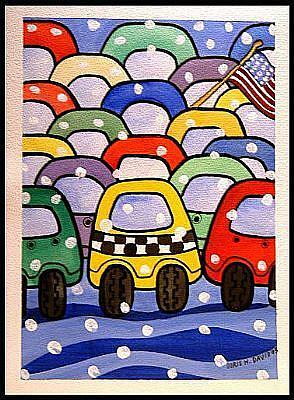 It depicts rush hour on a day when the snow is beginning to fall. Someone in one of the cars in front is patriotically waving an American flag and the checkered cab seems to be making little progress towards it's destination. Hopefully, the passengers aren't trying to catch a flight. After having recently dedicated time to my feelings about the war, it is uplifting and refreshing to paint a very American scene, albeit one of "gridlock", in the greatest city in the world.....the city of my birth, New York City .